I think they have a similar project at OSAA. Bertho, Rohde: bring it on!! That is the most epic USB-i2c converter ever. but what does the right side imply? That she is hoisting a brew? black and yellow black and yellow black and yellow black and yellow. Best geeky bathroom Occupancy sign I’ve seen yet! There;s an electromechanical 7-segment display (from a scoreboard or something; it’s quite large) somewhere in the space. The segments are hinged and move in and out of view using two magnets. Flip-dot displays are basically arrays of one solenoid per dot. Which gets spendy fast. I used to work on those! That is amazing. Any details on how you drive it? 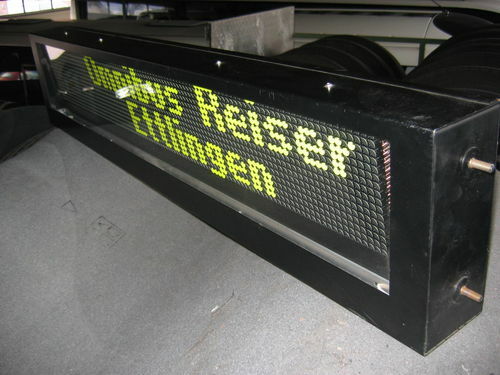 Hey, I’m looking to build a multiple panel flip dot display. I can see that this is from AlfaZeta, I am wondering how you got started with programming it. Please let me know, thank you. Hey, I’m looking to make a multiple panel flip dot display. I can see that you are using an AlfaZeta board, which is what I am looking to purchase. Can you please tell me how you got started with programming it? Thank You.